Follow these 10 steps to recreate this classic dish. Heat oil, butter and onions in a medium sized pot. Sprinkle onions with salt and pepper and allow to cook until soft and sweet. Sprinkle flour over surface of onions and gently stir to form a roux. Little by little, begin adding the beef broth, stirring as you go. Allow soup to simmer for about 15 minutes. Gently stir in beef bouillon until melted. Meanwhile turn oven to broil. 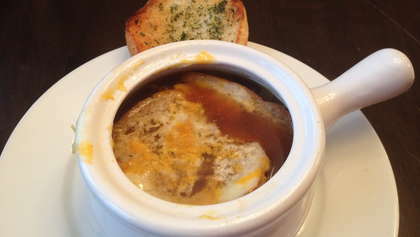 Fill onion soup dishes with soup and top with pre-toasted bread. Cover top of bread with a slice of cheese and broil for 20-30 seconds until cheese is bubbly. Serve with toasted garlic bread for dipping.